In this long-running series of nearly wordless picture books, young Madeleine and her beloved Rottweiler, Carl, set off for a Halloween evening adventure. 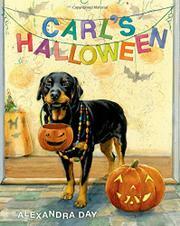 The book opens with Madeleine and Carl greeting trick-or-treaters at their front door. While they offer candies to the costumed kids, the girl’s mother is off to the side talking on the phone. Then, per series formula, the mother makes a decision that will make most parents uneasy. “I have to go help Grandma for a little while. You can hand out candy to any children who come.” Once the mother leaves, chubby preschooler Madeleine begins to decorate Carl with beaded necklaces. She then finds a big floppy hat to wear, and off they go into the night, trick-or-treating with abandon and even attending a Halloween party. Vignettes show the two enjoying themselves until it is time to turn toward home. With Madeleine riding on Carl’s back, they make it home right before the mother returns. The mother comments that “next year, you two will be able to go trick-or-treating yourselves.” Although children may wish they had such independence to go off on their own, the reality is that this title may be more an example of what not to do on Halloween night than anything else.